I like gifts, particularly Mothers Day gifts, to be something that is a combination of beautiful and practical. That can be a daunting order to fill. 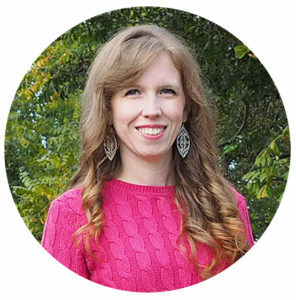 I am certain that the practical aspect comes into play because of my Mom. On one hand she might be the easiest person in the world to buy a gift for because she is genuinely happy with almost anything you give her. On the other, she’s not really a kitschy person. She doesn’t buy knick-knacks on vacation. She will never be confused for a person who loves to shop (that’s my Dad). So I often feel stumped on what to give her. This year I’ve settled on a set of knit cozies. These fit perfectly around a pint sized mason jar. 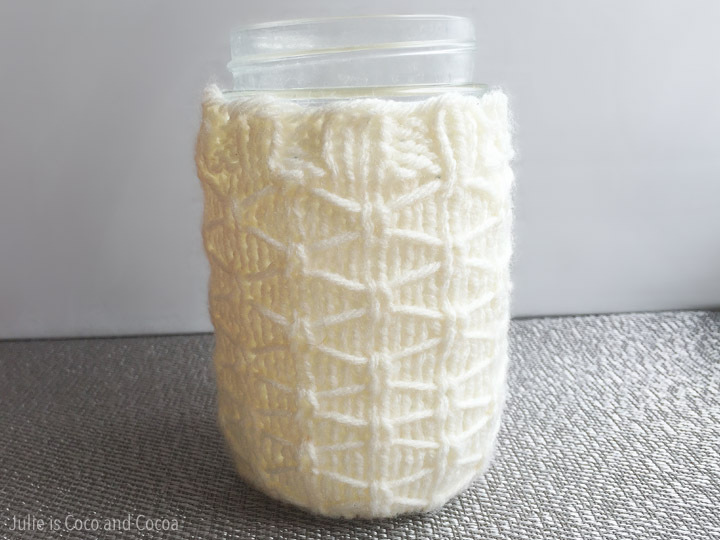 Rather than just going around the mason jar, where they might slip off, the mason jar just snugly inside the knit cozy. (This might mean that this isn’t actually a cozy. I’m not entirely sure.) 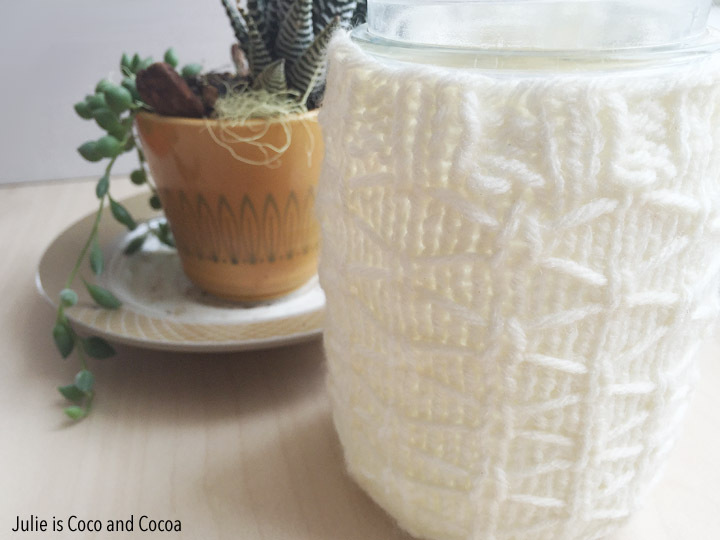 Either way, if you’re using the cozy to protect your hands from hot or cold drinks you won’t have to worry about the cozy slipping off and the jar crashing to the ground. Cause that would be bad. Of course you don’t have to use the mason jar for drinks at all. 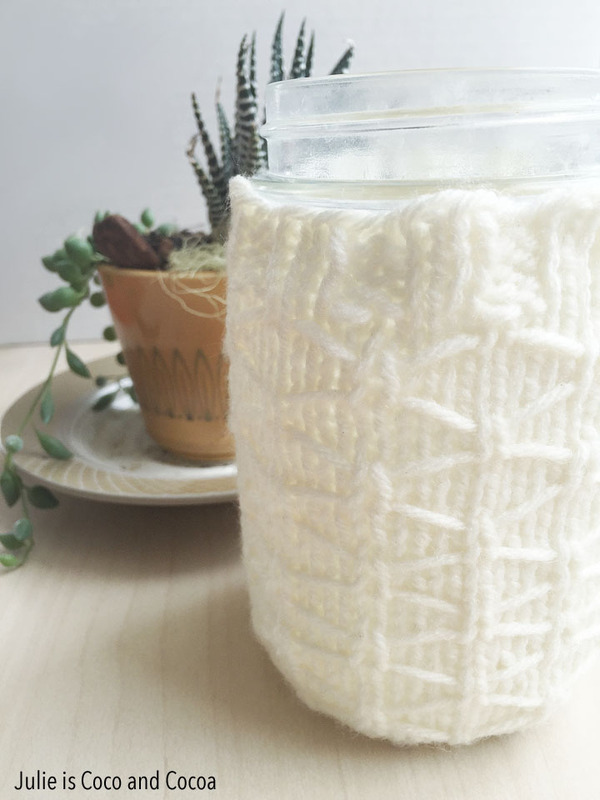 With the knit cozy around it you could fill it with flowers and use it as a vase. Or fill it with candy and keep it on a desk or counter. It could even be a secret stash since no one can see what’s in the jar with the cozy over it. I’m going to make a few of these in a bunch of different colors. The cozy is knit from the top down. If you want to make the pattern larger: The ribbing is in multiples of 4 and the lattice part of the pattern is done in multiples of 6.